Sandra Boynton's books quickly invaded our home after we had kids. A couple of her books were part of the stack of the very first children's books I purchased after having a baby. A friend recommended Blue Hat, Green Hat to us and since then we have acquired several more of Boynton's books. Boynton has a special talent for writing stories about and illustrating animals in a humorous, amusing way. Cows, pigs, chickens...oh, it's easy to identify one of her books from a random stack. Yes, that is part of her appeal. And now she has written an entire book about cows. That's right. Cows. I'm very excited to introduce the latest in children's cow literature, "truly outstanding in the field," Boynton's newest book, Amazing Cows. "The Thing About Cows" - "Much has been written about why cows are so widely admired. Or maybe nothing at all has been written about that. We forgot to check. ... In fact, what makes cows most amazing is that they don't have to actually DO anything to be amazing. They just ARE." When you live in America's Dairyland, you're always up for reading the newest "moooooooooving" cow themed book. It's practically required. Amazing Cows showcases Boynton's trademark cartoon illustration style, but it is written for a slightly older audience, the children that have out-grown her toddler books. 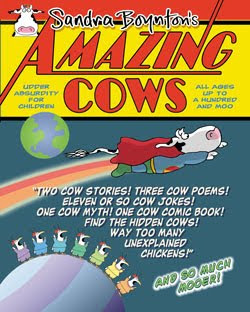 An entertaining mishmash of cow stories, poems, jokes riddles and comics with a few chickens and pigs thrown in, the book is billed as "Udder Absurdity for Children." That's putting it lightly. The whole book is full of the oddly alluring, shake your head kind of humor that both kids and even adults will want to page through -- there's a cow riddle here, and a bovine joke there, here an udder, there a moo, every where a moo moo (oops, sorry, got a little carried away with the cow hilarity myself). And, not surprisingly, none of it is even the slightest bit factual. It's just plain clever funny. Amazing Cows reads like a magazine with lots of little sections that don't really have much to do with each other except for the fact that they all discuss cows in some shape or form. First off and my daughter's favorite -- it includes barnyard knock-knock jokes, other cow jokes and even a limerick. My daughter also giggled at "The Four Stages of Metamoophosis." Udderflys are awesome! There are a number of short stories. The "Red Rover" one is the funniest and introduces 137 cows from North Dakota that play a game of red rover with three chickens. In the middle of the book is an Amazing Cow Comic Book, "Trouble on Zebllor." The cover shows that comic book character named Tad Humble in his superhero outfit. We're still trying to figure out what the comic was all about...something to do with a snore war. Cows, cows, cows. Frankly, it's a bit of a challenge to count all the cows in the "Find the Hidden Cows" spread, but if you have good eye-sight, make sure to take a glance at The Moo York Times on the bottom right corner and have a laugh at the name on the spotted piano. Some the content in this book will likely be over the top of the average child's head. At first, I was a little worried what my daughter would make of the book. But once we started reading, she didn't want to put it down. We read it together cover to cover. She wanted more knock-knock jokes. That's her only criticism. Can't have a review without a corresponding craft and activity! 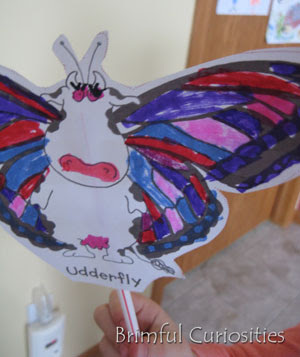 We made Puppet Udderflies from The Official Sandra Boynton Event Kit. (page 6) Our udderflies have given up fluttering. They prefer "cattle-pulting" around the house, instead. Workman Publishers has graciously offered to give away a copy of Boynton's Amazing Cows. To enter this contest, leave a comment relevant to this post. Do you have a favorite Boynton book? I love Boynton's books. I can't think of a favorite, but I would definitely love a cow book! My little one loves the Barnyard Dance and Snuggle Puppy. My kids loved Boynton's books when they were younger. We were especially fond of The Belly Button Book, but all of her books were popular in our house. I haven't seen this book yet, but it sounds cute. I bet my son would appreciate the humor! I remember my daughter's favorite Boynton book was BARNYARD DANCE. Thanks for the chance to win. If i win I will be sharing it with my preschool class. Like everyone else, we love Boynton. This books looks like a lot of fun. I don't have a fave boynton book but I love children's books for my kids. I've always enjoyed reading The Going to Bed Book to my kiddos! My favorite is "opposites". There aren't too many good opposite books out there and hers is one of the best! You're in my Google Reader. This book would be great for my bigger kids and my husband - he loves cows. Thanks for the ideas and review.. Yeah you are right about me.. Thanks.. I am having a Baby.. The belly button book was a fav in my house! I don't have a favorite Boynton book but I enjoy them. I grew up on a farm and we had cows so I know I'd enjoy this book! I am a follower and subscribe by email. I do not have a favorite, this is the first one I have heard of. I grew up on Little House on the Prairie, but I have three boys, and boy books are a new world to me! We love Boynton in our household!!!! I think one of our faves is probably Moo Baa La La La and it is not uncommon for me to purchase a Boynton book for all expectant mothers I know! I can't wait to see this new one!! I also subscribe via RSS feed! She did a trio of board books that where sold together Opposites, The Going to Bed Book and But Not The Hippopotamus that are very popular at our house. The second grandchild loves them as much as the first. Darling book...we used to have a dairy farm! I love Barnyard Dance! Just letting you know my Round Robin is tomorrow.. I don't have a favorite, but I think that my daughter would love this one! Boynton's books are great, although I can't say I have a favorite. I love cows and this book looks fun! Belly Button Book for us! Of the many favorites, Snuggle Puppy is the best! Her books are great! My favorite is "My Personal Penguin". Follow on twitter. Posted giveaway. I follow you - and picking my favorite Boynton book is hard! I love her ABC book. Moo, Baa, Lalala and But Not the Hippopotamus are my daughters' favorites. LOVE Boynton. I love Boynton books! My favorite is Moo Baa La La La, and I can still quote it word for word from 13 years ago when my son was a baby. It is just an awesome book. My daughter is definitely too young for this particular book, but I know that my husband and I would love it and Adaline will grow into it eventually. She loves cows which she always refers to as "Moos"! Blue Hat, Green Hat would have to be our favorite! My son used to giggle hysterically when we read it. Barnyard Dance is a favorite. Please enter me in the giveaway. At my house, we really enjoy The Belly Button Book! Thanks--please enter me in the giveaway. Wow - I don't know if I can pick a favorite! Haven't seen this cows book, but know we'd love it too! Click Clack Moo is my faborite. I like the Perfect Piggies book. Our favorite Boynton book is Moo, Baa, La la la! love boynton! Our current fav is Philadelphia Chickens and we're sining along with the CD! We love Boynton books at our house!!! The going to bed book with a favorite bedtime story for both of my kids. My daughter still reads them. Haven't seen them before but perfect piggies looks cute. I used to have a calendar of her work. Very talented. I haven't actually read any Boynton books yet but I have bought many a greeting card. I have never read a Boynton book, but would love to try these cows ones! my favorite is "Your Personal Penguin" :) Thanks for hosting a great contest! "Fifteen Animals!" is my book of choice! Thanks for the giveaway! Our favorite Boynton book is "But Not the Hippopotamus". Follow via GFC (Bornajhawk) and e-mail subscriber. My favorite Sandra Boynton book is "Not The Hippopotamus"
The only Boynton book I know is Moo Baa La La La!, but it's great! Definitely a favorite! Our favorite has been The Going To Bed Book!